In this lesson, we will learn how to solve problems on the equilibrium of a body on a rough inclined plane. The figure shows a body resting on a rough inclined plane where the coefficient of static friction between the body and the plane 𝜇 = 0 . 4 8 7 𝑠 . Given that the body is on the point of sliding down the plane, find the angle of inclination 𝜃 rounding your answer to the nearest minute if necessary. A body weighing 60 N rests on a rough plane inclined to the horizontal at an angle whose sine is 3 5 . The body is pulled upward by a force of 63 N acting parallel to the line of the greatest slope. Given that the body is on the point of moving up the plane, find the coefficient of friction between the body and the plane. The figure shows a body of mass 46 N resting on a rough inclined plane. Given that the body is on the point of sliding down the plane and that the coefficient of static friction is √ 3 , find the magnitude of the limiting friction. A body weighing 195 N is on a rough plane that is inclined at an angle of 4 5 ∘ to the horizontal. If the coefficient of friction between the body and the plane is √ 3 3 , which of the following is true about the body? AThe body is on the point of sliding down the plane. BThe body is sliding down the plane. CThe body is in a stable state of equilibrium. A body weighing 92 N rests on a rough plane inclined at an angle of 3 0 ∘ to the horizontal. The coefficient of friction between the body and the place is √ 3 5 . A force of 60 N is acting on the body up the line of greatest slope of the plane causing it to be in a state of equilibrium. Determine the magnitude of the friction stating whether it is acting up or down the plane, and state whether the body is on the point of moving or not. A 𝐹 = 1 4 N acting down the plane. The body is not on the point of moving. B 𝐹 = 1 4 N acting down the plane. The body is on the point of moving. C 𝐹 = 1 0 6 N acting up the plane. The body is not on the point of moving. D 𝐹 = 1 4 N acting up the plane. The body is not on the point of moving. A body weighing 56 N rests on a rough plane inclined at an angle of 3 0 ∘ to the horizontal. 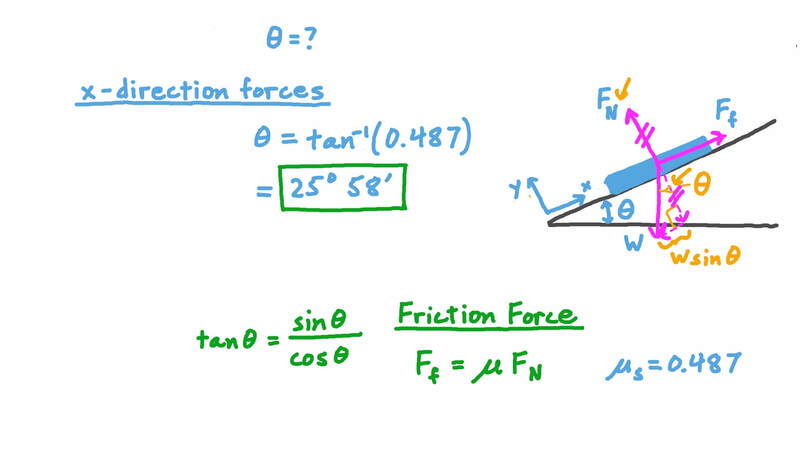 The coefficient of friction between the body and the plane is √ 3 6 . The body is pulled upwards by a string making an angle of 3 0 ∘ to the line of greatest slope of the plane. Determine the minimum tension in the string required to cause the body to be on the point of moving up the plane. A body weighing 200 N rests on a rough plane inclined at an angle of 3 0 ∘ to the horizontal. The body is pulled upwards by a string making an angle of 3 0 ∘ to the line of greatest slope of the plane. When the tension in the string is 8 0 √ 3 N, the body is on the point of moving up the plane. Find the coefficient of friction between the body and the plane. A body of weight 𝑊 N rests on a rough plane that is inclined at an angle of 6 0 ∘ to the horizontal. A force 𝐹 is acting on the body up the line of greatest slope of the plane. When 𝐹 = 3 3 N , the body is on the point of moving down the plane. Whereas when 𝐹 = 5 5 N , the body is on the point of moving up the plane. Find the value of 𝑊 and the coefficient of friction 𝜇 between the body and the plane. A body weighing 60 N rests on a rough inclined plane. A force 𝐹 acts on the body such that its line of action is up the line of greatest slope of the plane. When 𝐹 = 6 7 N , the body is on the point of moving up the plane, and when 𝐹 = 3 6 N , it is on the point of moving down. Find the angle of inclination of the plane rounding your answer to the nearest minute if necessary. A body weighing 198 newtons rests on a rough inclined plane. When the plane is inclined at 3 0 ∘ to the horizontal, the body is on the point of moving down the plane. The angle of inclination of the plane was then increased to 6 0 ∘ . Find the minimum force required to keep the body in equilibrium given that the force is acting up the line of the greatest slope of the plane. When a body of weight 262.5 N was resting on a rough plane inclined to the horizontal at an angle whose tangent is 3 4 , it was on the point of moving. The same body was later placed on a horizontal surface of the same roughness. A force 𝐹 acted on the body pulling upwards at an angle of 𝜃 to the horizontal where s i n 𝜃 = 3 5 . Given that, under these conditions the body was on the point of moving, determine the magnitude of 𝐹 and the normal reaction 𝑅 . A body weighing 20 N rests on a rough inclined plane. An upwardly inclined force 𝑃 acts on the body such that its line of action is parallel to the line of greatest slope of the plane. Given that when 𝑃 = 2 2 N , the body is on the point of moving up the plane and when 𝑃 = 1 0 N , it is one the point of moving down the plane, determine the coefficient of friction between the body and the plane. A body weighing 237 N was resting on a rough plane inclined at 4 5 ∘ to the horizontal in limiting equilibrium. The angle of inclination of the plane was increased to 6 0 ∘ and a force 𝐹 was applied to the body to keep it in its state of limiting equilibrium. Given that the force was acting parallel to the line of greatest slope of the plane, find the magnitude of the force 𝐹 rounding your answer to two decimal places if required. A body weighing 73 N rests on a rough plane inclined to the horizontal by an angle whose tangent is . A force acts on the body holding it in limiting equilibrium on the point of sliding down the slope. Given that the force can either be applied horizontally or up the line of greatest slope of the plane, find the magnitude of the force and the coefficient of friction . A body weighing 25 N rests on a rough plane inclined to the horizontal at an angle whose cosine is 4 5 . The coefficient of friction between the body and the plane is 1 5 . A force of magnitude 𝐹 acts on the body holding it in a state of equilibrium. Given that the force acts up the line of greatest slope of the plane, what can we know for certain about the value of 𝐹 ? A body weighing 407 N was resting on a rough plane inclined at an angle of 3 0 ∘ to the horizontal in limiting equilibrium. The angle of inclination of the plane was increased to 4 5 ∘ and a force 𝐹 was applied to the body acting parallel to the line of greatest slope of the plane. As a result of the action of the force, the body was on the point of moving up the plane. Find the magnitude of the force 𝐹 rounding your answer to the nearest newton if necessary. A body weighing 422.9 N rests on a rough plane inclined at an angle of 𝜃 to the horizontal where t a n 𝜃 = 3 4 . The coefficient of friction between the body and the plane is 1 2 . Calculate the minimum horizontal force required to cause the body to be on the point of moving up the plane. A body weighing 75 N rests on a rough plane inclined at an angle of 4 5 ∘ to the horizontal under the action of a horizontal force. The minimum horizontal force required to maintain the body in a state of equilibrium is 45 N. Find the maximum horizontal force that will also maintain the equilibrium. A body weighing 90 N rests on a rough plane inclined at an angle of 𝜃 to the horizontal. The minimum horizontal force required to prevent the body from sliding is 36 N, whereas a horizontal force of 65 N causes the body to be on the point of sliding up the slope. Determine the angle of friction 𝜆 between the body and the plane rounding your answer to the nearest minute if necessary. A body of weight 𝑊 N was resting on a rough plane inclined at an angle of 4 5 ∘ to the horizontal. A force of 7 5 √ 2 N was acting on the body up the line of greatest slope of the plane causing it to be on the point of sliding down the plane. If the same body were then to be placed on a horizontal plane of the same roughness, a horizontal force of 350 N would be required to cause the body to be on the point of moving. Find the value of 𝑊 and the coefficient of friction 𝜇 between the body and the plane. A body weighing 10 N rests on a rough plane. The angle of inclination of the plane is gradually increasing. The body is on the point of sliding down the plane when the angle of inclination is 4 4 ∘ . Determine the coefficient of friction between the body and the plane stating your answer to two decimal places. A body weighing 𝑤 rests on a rough plane that is inclined to the horizontal at an angle whose sine is 6 1 0 . The coefficient of friction between the body and the plane is 1 7 . A horizontal force of 40 kg-wt acts on the body causing it to be on the point of moving up the plane. Given that the line of greatest slope of the plane, the body, and the line of action of the force all lie in the same vertical plane, find the weight of the body 𝑤 . A body weighing 675 N rests on a rough plane that is inclined to the horizontal at an angle whose tangent is 3 4 . It is attached by a light inextensible string passing over a smooth pulley fixed at the top of the plane to a scale pan of weight 10 N hanging freely vertically below the pulley. Given that 150 N is the minimum weight that needs to be added to the scale pan to maintain the body in a state of equilibrium, determine the maximum weight the scale pan can hold without causing the body to move. A smooth pulley is fixed to the face of a rough inclined plane. Two bodies of mass 3 N and 24 N rest on the plane a little below the pulley at the same height as one another. They are connected to each other by a light inextensible string which passes over the pulley. The coefficient of friction between each body and the plane is . Given that the angle of inclination of the plane is gradually increasing, find the maximum angle at which the two bodies remain in equilibrium. Round your answer to the nearest minute if necessary. A body of weight 93 N rests on a plane inclined at an angle of 4 5 ∘ to the horizontal. The coefficient of friction between the body and the plane is 0.1. A horizontal force acts on the body causing it to be on the point of moving down the slope. Given that the force’s line of action, the body, and the plane’s line of greatest slope all lie in the same vertical plane, determine the magnitude of the force rounded to two decimal places.